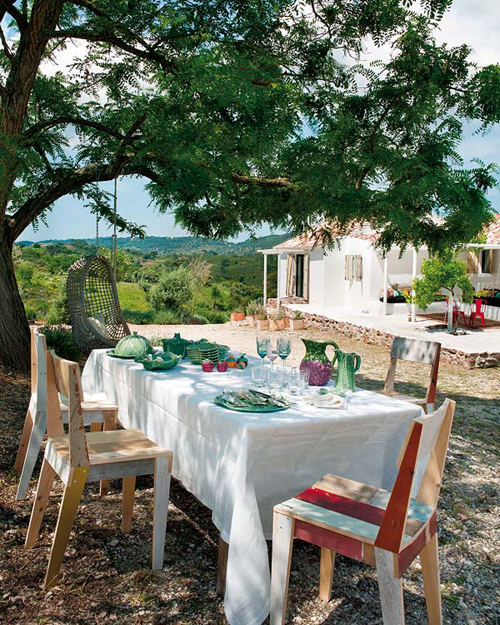 Today we take a virtual trip to Portugal where we will take a peek into this stunning country home in Palmela, which is not far from Lisbon. This is the refuge of interior designer Monica Penaguião. The building itself is simple and rustic, it’s the mix of modern furniture that gives color to the various rooms. The lounge area (top image) is stunning. 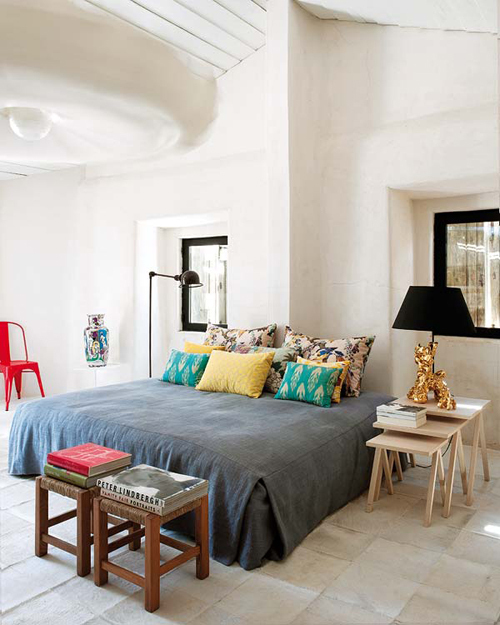 Thick mattresses and cushions made from Turkish fabrics are great for an afternoon nap. The kilim rug is an antique. The stools and chairs are from Tolix. 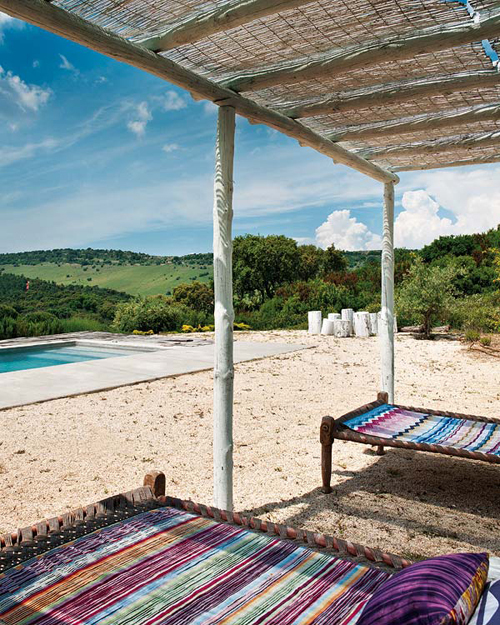 The handmade pergola gives shade to the pool area (image above). 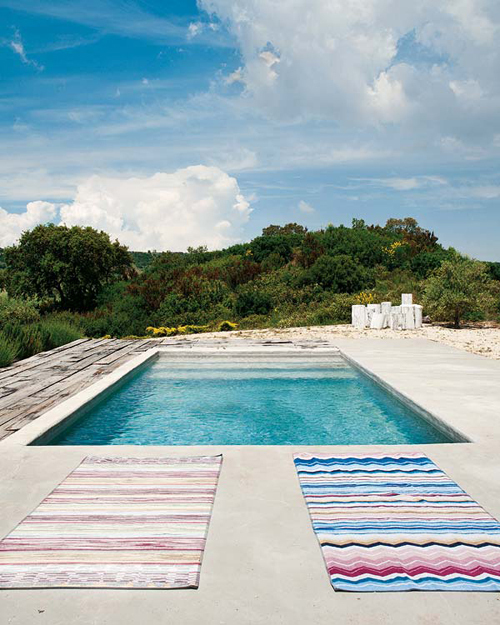 Missoni towels brighten up the sun beds that were purchased on a trip to India. The beautiful table ware is from Kenzo. 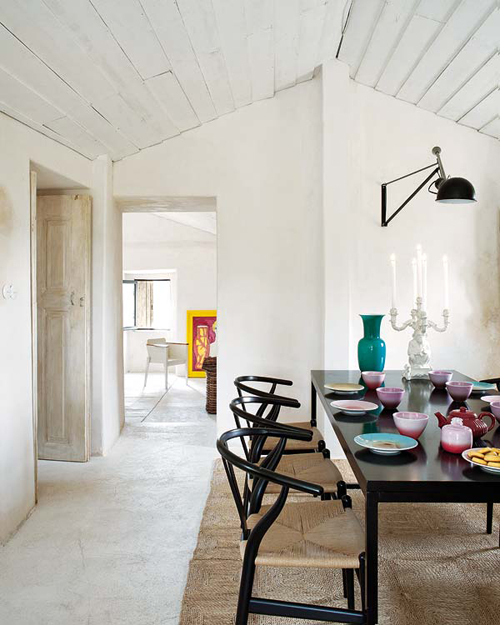 The chairs around the dining table are the Wishbone chairs from Hans Wegner. The stone sink in the kitchen is mounted on an iron frame. 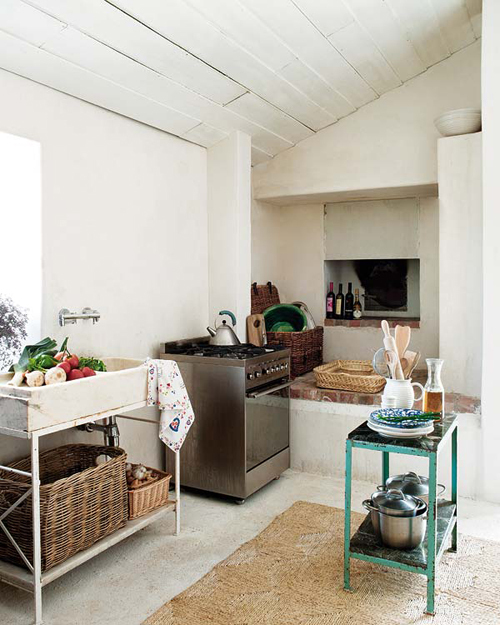 An old wood oven is used for baking and gives warmth in winter. The green lamp in the dining room is designed by Marcel Wanders for Capellini. 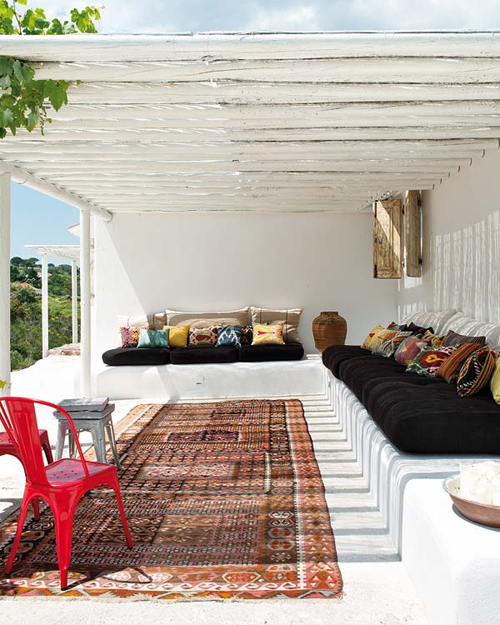 The rotan stools were purchased in the region of Alentejo. The colorful painting by Brazilian artist Isabelle Tuchband gives perfect contrast against the white wall. The chair made from scrap wood is from Piet Hein Eek. A perfect place for al fresco eating! The dishes are from Bordallo Pinheiro, the glasses from Kenzo and the chairs are made from recycled wood by Dutch designer Piet Hein Eek. Doesn’t the pool look very inviting?! 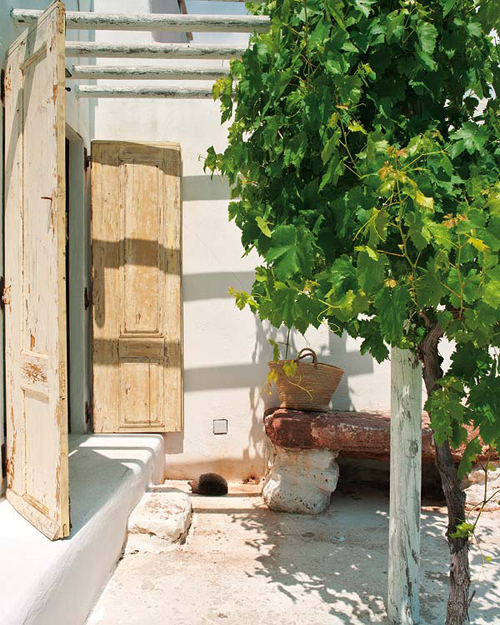 The whitewashed walls and old wooden doors (image below) maintain the authentic charm of the building. i love everything about it…the kitchen is so adorable and wow to take an afternoon nap and then get in the pool!!!!! oh my stars!! That green jumbo lamp is heavenly!!! Love the houe! I’m from Portugal 😉 Mónica as such a great sense of style! she’s a fabulous interior designer! Beautiful images.. love the plum colors in the lounge area.. Absolutely love it!!! Take me there now!! Great inspiration for the room I am currently working on. Thank you! See you soon, with more houses…. 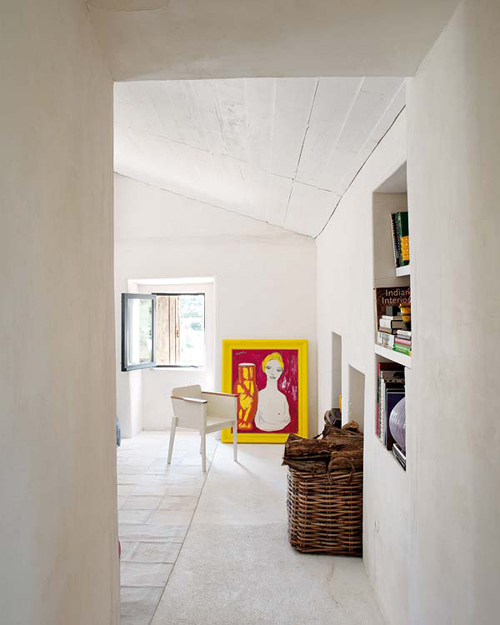 I love how they blended the old portuguese style with a more modern architecture! I would love to have a mediterranean style house! I love it really great. Thanks for sharing these unique and incredible ideas. As a student in a university, it’s really inspirational and motivates me to design my own house even if i will be lived 1-2 years there.